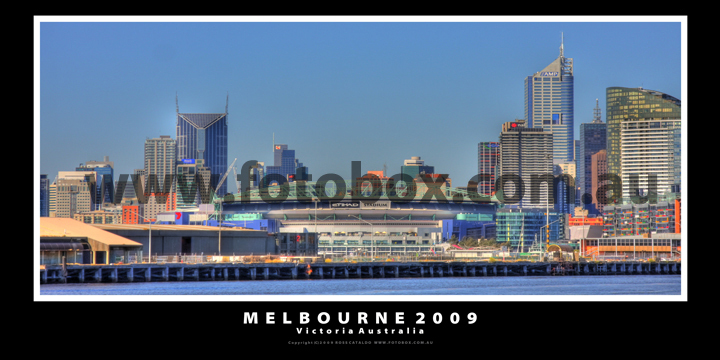 Image Information "Melbourne is the capital city and most populous city of the State of Victoria, and the second most populous city in Australia. The Melbourne city centre (also referred to as the "CBD") is the anchor of the larger geographical area and statistical division known as the Greater Melbourne metropolitan area – of which Melbourne is the common name. As of 2009, it had an approximate population of 4 million. The demonym for a person from Melbourne is a "Melburnian"
The metropolitan area is located on a large natural bay known as Port Phillip. It extends from the CBD at the estuary of the Yarra River (which enters the bay at its northern-most point), along the south-eastern and south-western shorelines of Port Phillip, and extends into the hinterland. The CBD is located in the municipality known as the City of Melbourne, and the metropolitan area consists of a further 30 municipalities – which are referred as "cities" and "shires". It was established in 1835 (47 years after the European settlement of Australia) as a pastoral township by free settlers from Van Diemen’s Land. It was named in honour of the 2nd Viscount Melbourne, William Lamb (the[Prime Minister of the United Kingdom during the reigns of King William IV and Queen Victoria) in 1837. Melbourne was declared a city by Queen Victoria in 1847; and became the capital of the newly-declared Colony of Victoria, when it was created from the Colony of New South Wales, in 1851. When gold was discovered in the area during the 1850s (which sparked the Victorian gold rush), Melbourne was transformed into one of the largest and wealthiest cities in the World by the 1880s. Upon the federation of Australia in 1901, it served as the national capital and the seat of government for the newly-established Commonwealth of Australia until 1927 – while the planned national capital of Canberra was being constructed. It is the birthplace of Australian film and television (as well as the World’s first feature film), Australian rules football, Australian impressionist art movement (known as the Heidelberg School) and Australian contemporary dance (including the Melbourne Shuffle and New Vogue styles). It is also home to Australia’s very first, and largest, art gallery (the National Gallery of Victoria) and largest sports stadium (the Melbourne Cricket Ground). The CBD is also notable for its distinct blend of contemporary and Victorian architecture, expansive parks and gardens, alleyway and arcade culture, diverse multicultural society, and is also home to the World’s largest tram network. Since 2002, Melbourne has been consistently ranked amongst the World's Most Livable Cities by The Economist magazine,] and is recognised as a Beta World City+ by Loughborough University. It is also classified as a City of Literature by UNESCO,] and is ranked as one of the top five university cities by RMIT. "